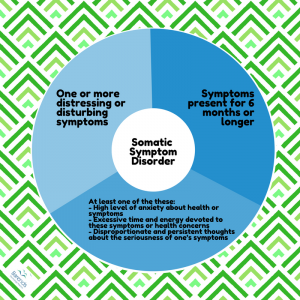 Somatic symptom disorder (SSD) is much more common than many other mental disorders, but often overlooked or misdiagnosed by professionals. As a consequence, people with SSD have twice the annual medical care costs . A proper somatic symptom disorder diagnosis is very important to make sure people find the right treatment for the mental condition and recover as soon as possible. Without a proper somatic symptom disorder diagnosis, people with SSD may feel misunderstood, remain distressed, and disabled . Consequently, they stay in bed more often, take more sick leave, and are more often than other people unemployed . This page discusses the somatic symptom disorder symptoms and highlights the differences in both somatization disorder and somatic symptom disorder. Somatic symptom disorder used to be called somatization disorder, but with the release of the new DSM V they adjusted its criteria a little bit. If you are interested in the somatic symptom disorder test, please click here. (Advertisement. Scroll down for the DSM V criteria for somatic symptom disorder). A) One or more somatic symptoms that are distressing or result in significant disruption of daily life. C) Although any one somatic symptom may not be continuously present, the state of being symptomatic is persistent (typically more than 6 months).